Questioning is one of the most powerful instructional strategies we can use in the classroom! In fact, NCTM’s Principles to Actions (2014) states that effective teachers use “purposeful questions to assess and advance students’ reasoning and sense-making about important mathematical ideas and relationships” (p. 35). However, creating an environment where students are able to respond to questions and effectively use math talk during a classroom discussion can be challenging. Many of our students do not know how to discuss their mathematical ideas and strategies using key math vocabulary and concepts. As teachers, we play an important role as we help students identify their thinking processes and build new knowledge by connecting to ideas and concepts that they already understand. Choosing the right questions is an essential part of this process. 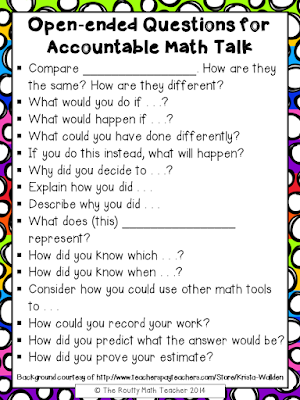 Read more about using questions and building effective math talk practices here.